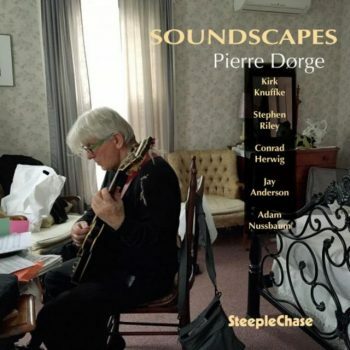 Guitarist Pierre Dørge has recorded relatively few small group recordings in his 30-year career, often preferring to record his music for the celebrated “New Jungle Orchestra.” For this 2018 SteepleChase release, however, Dørge presents his original music within the confines of a sextet. Besides Dørge, the group features cornetist Kirk Knuffke, tenor saxophonist Stephen Riley, trombonist Conrad Herwig, bassist Jay Anderson, and drummer Adam Nussbaum. Despite the smaller setting, Dørge’s unique compositional voice is easily recognizable, often recalling the music he has recorded with New Jungle Orchestra, but on a slightly smaller scale. The influence of Charles Mingus looms large in the foreground, with Dørge painting playful, brightly colored “soundscapes” (the fitting title of the album) that often blur the line between composition and improvisation. The title of the album’s opening track even references Mingus. The three horn players add to the color and textural shading of the compositions with their own extraordinarily unique tones. Knuffke’s bright and tightly controlled cornet sound will be immediately identifiable to those who are even moderately familiar with his work, as is the soulfully anachronistic whispered tone of Riley. Herwig of course commands an unparalleled tonal and timbral range that rounds out the horn line nicely. Dørge’s guitar functions sometimes as a fourth horn, adding further polyphonic depth to the group, and other times as harmonic shading for the soloists, but always with a particularly distinctive tone. What makes Dørge’s compositions successful is their interactive nature. The knotty polyphony of the horns often gives way to individual solos, but the rest of the group hardly sits out during the solos. Dørge challenges the horn players with highly interactive, often co-operative, comping, but the horns always seem to have a background figure or accent to add behind the solos. Anderson and Nussbaum (a common bass/drums team on the SteepleChase label) anchor the group and help give them direction, but they also seem especially sympathetic to the spontaneous nature of the music and help give each “solo” a distinctive feel and character. Standout tracks include the aforementioned “Mingus’ Birthday Party,” whose glaring dissonance and bright swing do indeed conjure images of the legendary bassist. “Enigmatic Twilight” sounds suspiciously like a contrafact of “Chelsea Bridge” but serves as a nice feature for Riley. His gentle, romantic tone combine with the rather abstracted nature of his harmonic palette (not to mention that of the rest of the band) for a sense of pleasing incongruity. “Afrikaa Mbizo Dyani,” a tribute to South African bassist Johnny Dyani, fits the pattern of lilting, song-like pieces that Dørge typically likes to include at least one of on his records. Overall it’s a very successful venture outside of Dørge’s setting, and fine proof that (like Mingus) he has a distinctive compositional voice that shines in a wide variety of settings. The uniquely interactive nature of the compositions also contributes to their success, as does the tasteful playing of the entire sextet. If there is a major flaw in the album, it is with the recording/mixing of the music; Riley is high up in the mix (probably a necessity, given the nature of his tone and style), however Herwig sounds like he is playing at the other end of a hallway from the rest of the group. Perhaps this was an intentional choice to give the music a more ambient, “soundscape-y” sound, but I feel the music could have benefited from greater clarity. Still, the album is a collection of well-crafted pieces that are exciting and unpredictable, as well as deep and rewarding, and merit several listens.